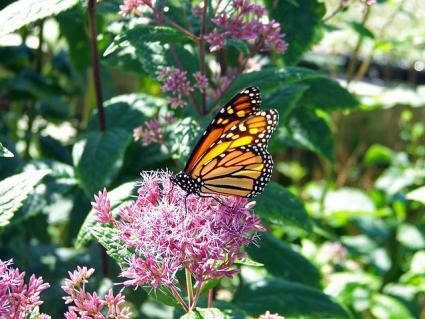 Milkweed is one of the top plants for butterfly gardens. It's easy to grow, often reseeds itself in the garden, and bears brightly colored blossoms in summer. There are dozens of milkweed species native to different regions of the country, but the milkweed most often planted by gardeners is a stunning tropical species called scarlet milkweed or bloodflower. 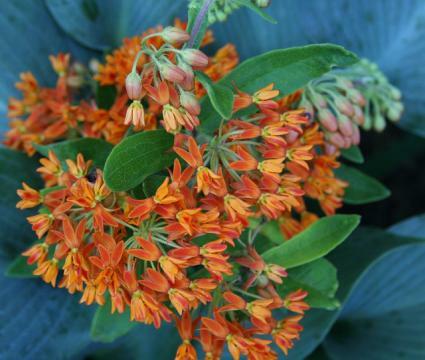 Known botanically as Asclepias curavassica, it has multi-colored red, yellow, and orange blossoms at the top of slender, dark-colored three-foot stalks. 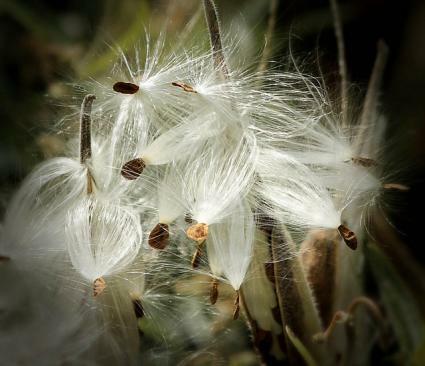 Besides their colorful flowers, milkweeds are known for their unusual silky seeds that float away on the wind in autumn. It grows as a perennial in places where winter temperatures stay above 15 degrees, but it is easy to grow it as an annual in colder climates. Scarlet milkweed is stellar in a cottage garden setting, mixed in with other perennials, or at the rear of a planting of smaller annuals. The leafstalks have a somewhat gawky appearance so it looks best with other plants around it that will fill the space in the foreground, rather than growing it by itself out in the open where the entire plant is visible. In warm climates it will seed itself and is useful in wildflower plantings. Scarlet milkweed is easily grown from seed. Sow indoors in flats of potting mix about six to eight weeks before the average date of last frost in your area and plant it outside in a sunny location once the weather warms. Milkweed is tolerant of poor soils, as long as drainage is good, and has moderate water needs. Pests and disease are rarely an issue with this or any of the milkweeds, nor is there much in the way of maintenance that is necessary. In climates without hard frosts, scarlet milkweed remains evergreen in winter, but otherwise the leaf stalks will die and can be cut to the ground to allow the plant to overwinter in the roots. In cold climates where it is grown as an annual, simply pull out the entire plant and start it again from seed the following spring. The basic species is quite stunning, but several cultivars of scarlet milkweed have been developed that vary the options for color. Silky Gold is a pure yellow variety. Silky Deep Red has deeply saturated red-orange flowers. Apollo Orange has pastel orange and yellow flowers. There are milkweeds native to nearly every corner of North America. Besides being more cold hardy than the tropical scarlet milkweed, many of them possess outstanding ornamental qualities of their own. The following are all suitable as part of wildflower mixes or for use in a perennial border. Asclepias incarnata, also known as swamp milkweed, has large clusters of purple-pink blossoms and very lush foliage. It grows up to three feet tall and is a good choice for wet locations, though it also grows well in other areas with average garden water. 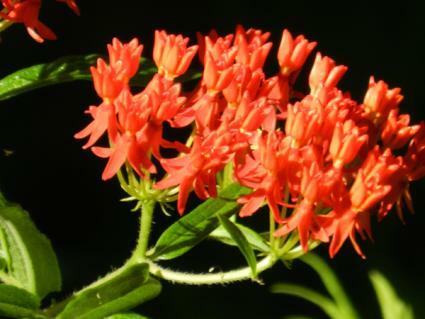 Asclepias tuberosa, commonly called butterfly weed, is quite similar in appearance to scarlet milkweed except the flowers are completely orange. It grows about two feet tall and is a good choice for the arid Western states. Asclepias syriaca, also known as common milkweed, has intriguing globe-shaped light purple blossoms and large oval-shaped leaves. It grows up to five feet tall and is a good choice for the humid Eastern states. Milkweed is the number one food source for caterpillars that turn into monarch butterflies, who lay their eggs on the plant as well. You are likely to see yellow and black caterpillars on the plants in late summer, but resist the urge to pick them off - they are the larval stage of the monarch butterfly.